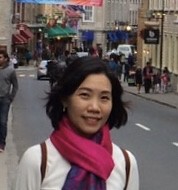 Post written by Rapat Pittayanon, MD, MSc, and Alan Barkun, MD, MSc, from the Division of Gastroenterology, Faculty of Medicine, Chulalongkorn University and King Chulalongkorn Memorial Hospital of the Thai Red Cross, Bangkok, Thailand, and the Division of Gastroenterology, McGill University and the McGill University Health Centre, Montreal, Canada. This study was focusing on prognostic factors of outcomes including immediate hemostasis, early and delayed rebleeding, and survival in patients presenting with GI bleeding from tumors who have received Tc-325 for hemostatic control. Patients with GI tumor bleeding have a low rate of hemostasis and survival when treated with conventional endoscopic techniques. A novel treatment with Tc-325 which avoids traumatizing the friable tumor surface may be a good treatment in such patients. Additionally, there may be certain factors that we need to explore to help optimize the selection of patients who will benefit most from Tc-325. This study confirmed a near-perfect immediate hemostasis rate of 97.7%. However, the delayed rebleeding rate at 30 days (38%) was comparable to conventional techniques. Importantly, good performance status (ECOG 0-2), non-end-stage cancer, and receiving definite hemostatic treatment (surgery, chemotherapy, radiotherapy, or radiological embolization) are independent predictors of 6-month survival. Furthermore, a randomized control trial study comparing survival in patients receiving Tc-325 versus conventional intervention versus non-endoscopic intervention should be conducted to confirm respective efficacies and potential benefits. Figure 1. 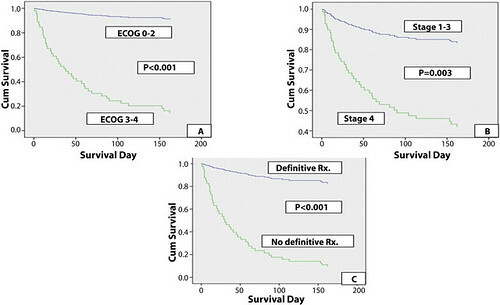 Survival graph in patients (A) ECOG 0 to 2 versus ECOG 3 to 4, (B) cancer stage 1 to 3 versus stage 4, (C) receiving definitive hemostatic treatment versus no treatment. The current data may assist clinicians with decisions regarding use of endoscopic and non-endoscopic treatments for malignant tumor bleeding and eventually help inform future trials attempting to better define evidence-based management algorithms in patients presented with GI tumor bleeding.